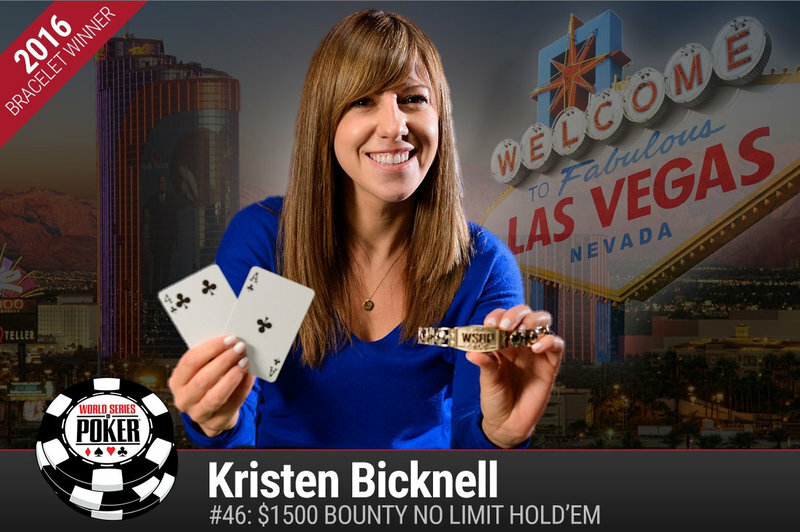 Kristen Bicknell has won the 2016 World Series of Poker $1,500 no-limit hold’em bounty event, defeating a field of 2,158 entries to win her second gold bracelet and the top prize of $290,768. The 29-year-old student and part-time poker pro won the WSOP $1,000 no-limit hold’em ladies event in 2013 but her victory today marks her first win in an open bracelet event. Bicknell is the first female player to win a bracelet at the 2016 WSOP. She is also the first Canadian player to win this summer, a feat made all the more noteworthy as she will receive the bracelet and hear her national anthem Friday afternoon on Canada Day. Bicknell scored 17 knockouts in this event, capturing 17 bounty chips that are each worth $500. With each player having a price on their head, at least figuratively, the action was fast and furious in this event. Bicknell came into day 3 of this event in second place among 36 players remaining. Play was halted at around 1:00 that night with Bicknell leading the final three players. When play resumed on Day 4 she scored her 16th elimination of the event to bust John Myung in third place, sending him home with $130,588. Bicknell took a 3-to-1 chip lead into heads-up play and made short work of Norbert Szecsi, closing the deal in under ten hands. On the final deal Bicknell raised to 450,000 from the button with blinds of 80,000 – 160,000 with an ante of 20,000. Szecsi called and the flop brought the J 9 6 . Szecsi check-called a bet of 300,000 and the turn brought the A . Szecsi check-called again, this time for 800,000. The river brought the 3 and Szecsi checked for a third time. Bicknell moved all-in, having him well covered. After some thought he made the call with 9-7 for a pair of nines, only to have Bicknell show him the A 4 for a pair of aces. With that Bicknell had secured the pot and the title. Szecsi was eliminated in second place, earning $179,625 for his deep run. Winner photo courtesy of WSOP.